Indoor pools are great options for rehabilitation from injuries, surgery or pain. Most in the northeast are indoor pools and are kept user friendly with water treatment systems designed for just that. Salt water pools are gaining momentum for use with indoor pools and are starting to become more available as new pool facilities are built. Contrary to popular belief, they do use chlorine but much less of it compared to the traditional indoor pools. Salt water pools have a specific generating system which manufactures its own supply of chlorine through electrolysis by releasing chlorine gas from salt in the water. It is all programmed and checked regularly for safe chemical levels. The actual salt levels are about 1/12 of that found in the ocean water. Chloramines are the end product of the combination of chlorine and organic substances in the water such as sweat, dirt, dandruff, body lotions and creams, deodorants and perfumes and other body fluids. They are the underlying reason for the “chlorine smell” often associated with enclosed pools. Skin care is a concern. Always shower with soap and water prior to entering the pool to reduce the chloramine production in the pool from your own body fluids and oils. Do the same upon exiting to remove the chemicals from your skin. I have found the smell of the pool chemicals on the skin is best removed with pool specific washes or a clarifying shampoo (Suave works fine!). Plain soap also is effective in cleaning the chemicals but a telltale smell may remain. Always apply a body cream (better than a lotion as it has less water in it) to your body while it is still wet to help trap moisture into the skin. Aquaphor is a great product if you get itchy skin. Apply it similarly to body cream. 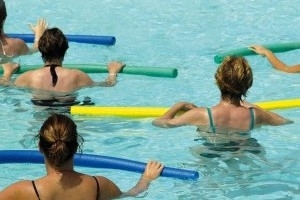 So to answer this question, yes, pool classes are okay for your skin with proper cleansing and moisturizing. You will benefit in many ways with attention to these details.